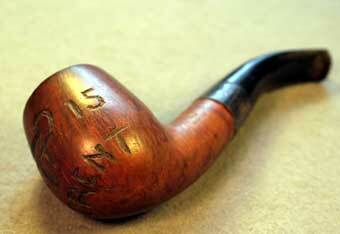 Lieutenant Thomas Henry Charles William Pritchard MC 1st/4th Battalion, King's Own Royal Lancaster Regiment. 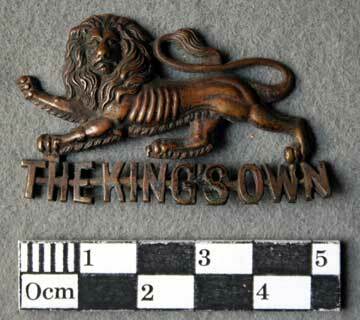 Thomas Henry Charles William Pritchard joined the King's Own from Officer Training Corps, commissioned to the 4th Battalion, King’s Own Royal Lancaster Regiment as 2nd Lieutenant on 27th June 1917. 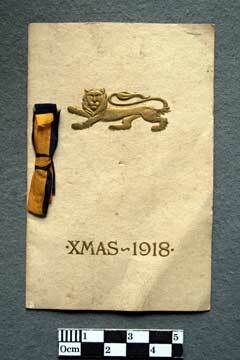 He was promoted Lieutenant on 27th December 1918. 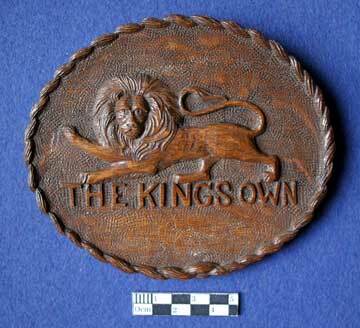 He was with the 1st/4th Battalion of the King’s Own on the Western from from November 1917. 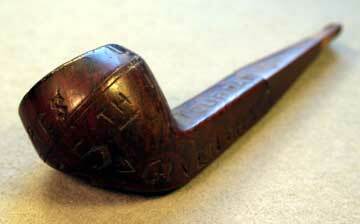 He was awarded the Military Cross on 16th September 1918. 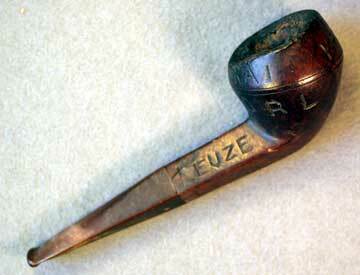 He was still with the 1st/4th King’s Own in March 1919 when they were located near Brussels. 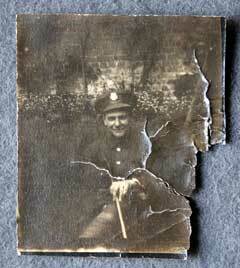 He is out of Army List March 1919. 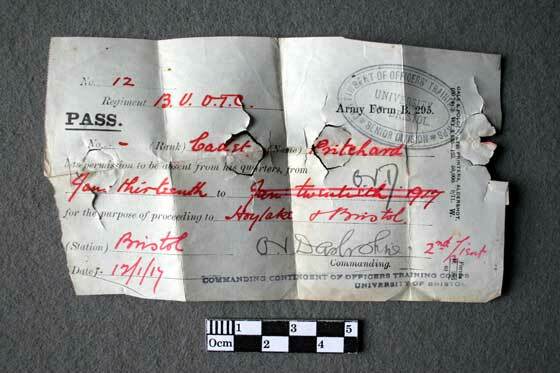 Lieutenant TA Reserve of Officers, 27th December 1918. 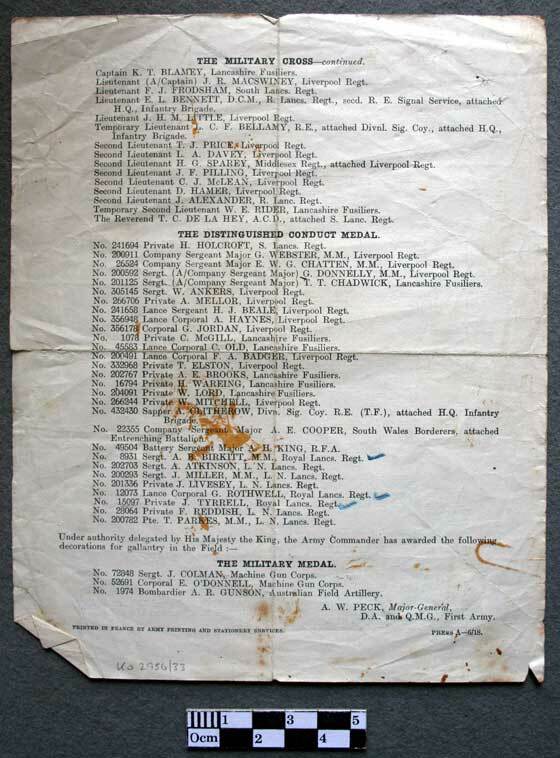 War Substantive Captain and Temporary Major 18th August 1942. Died 18th March 1974. 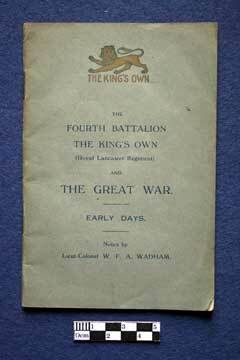 The Fourth Battalion The King’s Own Royal Lancaster Regiment and The Great War by Lieutenant Colonel W F A Wadham and Captain J Crossley, named to T H Pritchard, with a few notes by him. 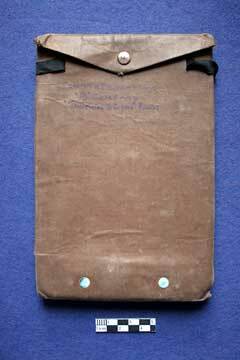 Message and Signals Note book and cover used circa Apr 1918 by 2nd Lieutenant Thomas Henry Pritchard of ‘B’ Company, 1st/4th Battalion, King’s Own Royal Lancaster Regiment. 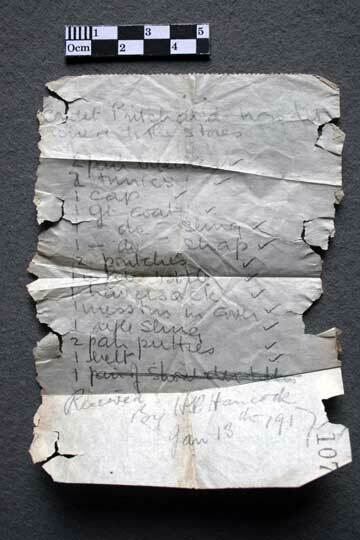 Entries 4 to 7 Apr 1918. 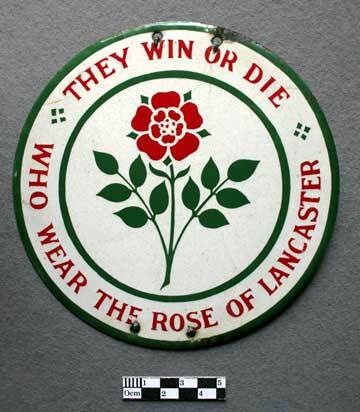 Grave Marker of the 55th West Lancashire Division. 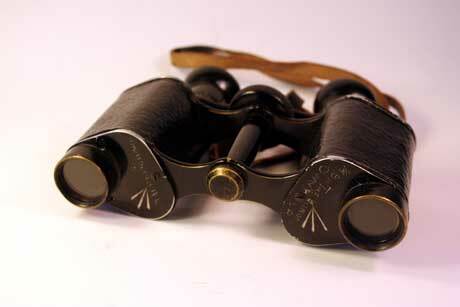 These were funded by the Division's Grave Registration Fund. 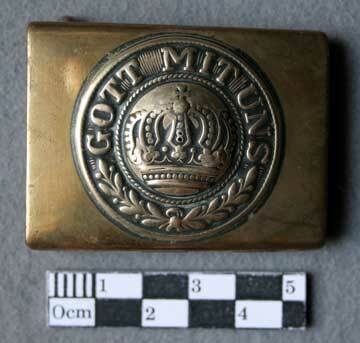 Sam Browne Belt of Lieutenant T H Pritchard, 1st/4th Battalion, King’s Own Royal Lancaster Regiment. 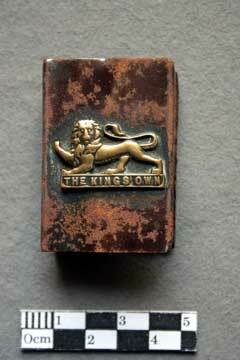 Metal match box holder featuring the badge of the King’s Own. 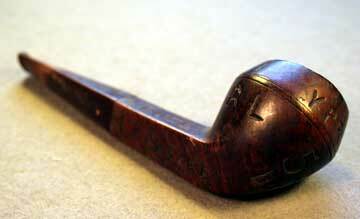 155 mm wide and 132 mm tall, 12 mm deep. 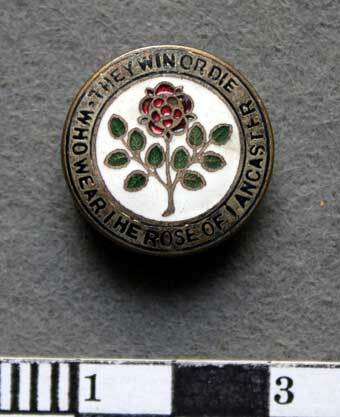 Cap Badge, Officers, worn by Lieutenant Thomas Henry Pritchard, 1st/4th Battalion, King’s Own Royal Lancaster Regiment. 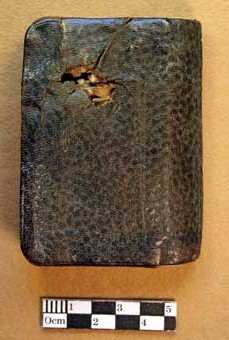 Pocket notebook of 2nd Lieutenant Thomas Henry Pritchard, with damage caused by bullet. 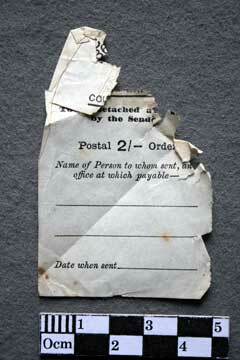 The address shown inside is ‘Holmstead’ Hoylake, Cheshire. 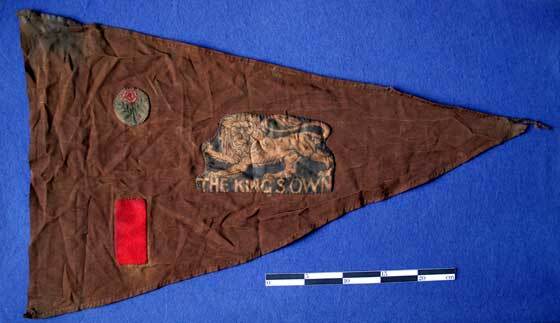 Pennant/Flag brown in colour with the badges of the King’s Own, 55th Division and a red rectangle sewn on to it. 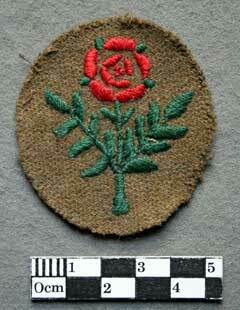 The red rectangle being the badge of the 1st/4th Battalion within the 55th Division. 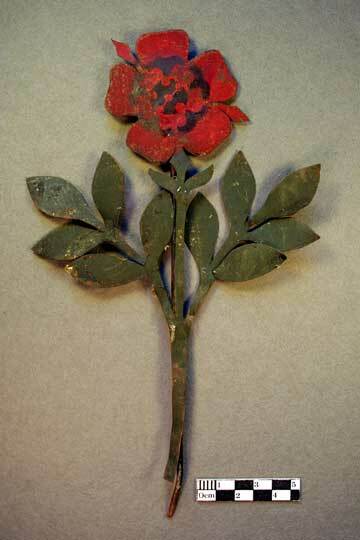 Red rose on green leafy stem made out of thin metal and painted red and green welded on to a single rod, representing the badge of the 55th West Lancashire Division. 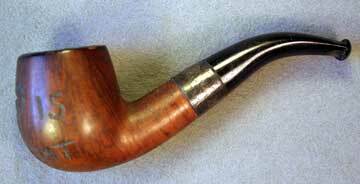 260mm tall and 152mm wide at it’s widest point. 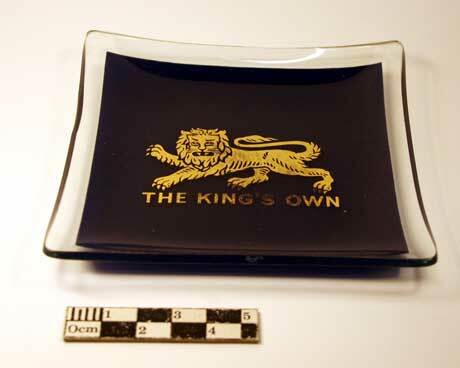 Glass ashtray, 1950s, King’s Own. 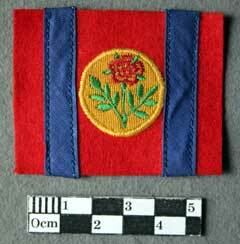 Patch featuring the badge of the 55th West Lancashire Division on yellow background, set upon a red rectangle with two blue stripes, possibly a Royal Engineers Unit, in the interwar years or later. 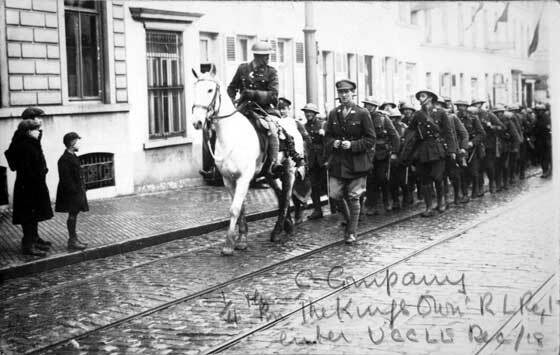 C Company, 1st/4th Battalion, King’s Own Royal Lancaster Regiment enter Uccle, Belgium, Dec 1918. 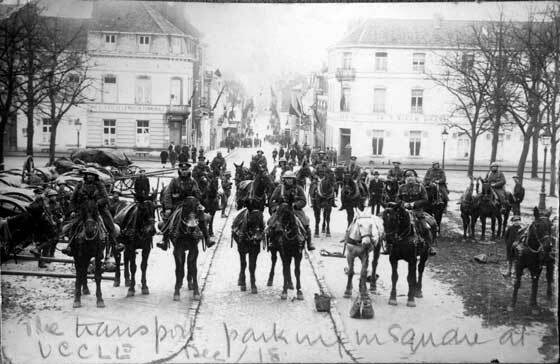 Troops wearing helmets with King’s Own badges follow a mounted officer. 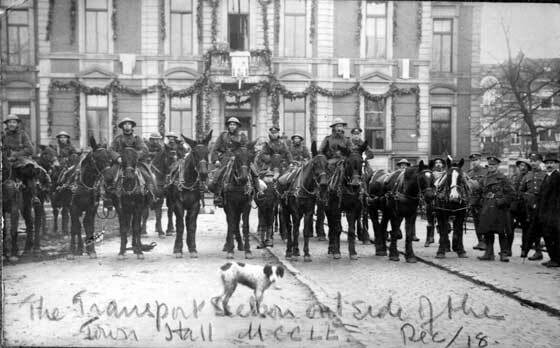 The Transport Section of the 1st/4th Battalion, King’s Own Royal Lancaster Regiment outside the Town Hall, Uccle, Dec 1918. 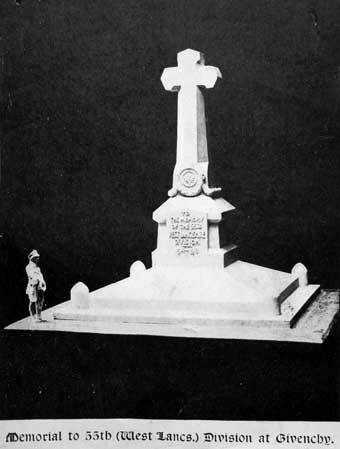 Memorial to the 55th West Lancashire Division at Givenchy, France. Colour Party of the 1st/4th Battalion, King’s Own Royal Lancaster Regiment. 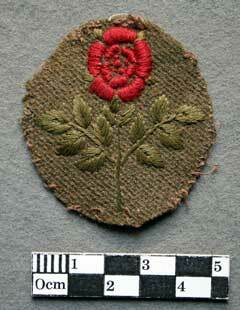 Possibly prior to the transfer of the Colours from England to Belgium, late 1918. 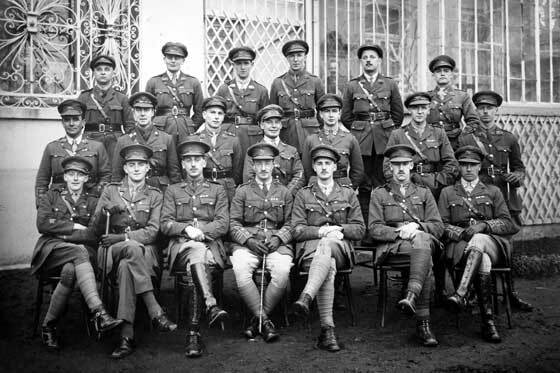 Officers of the 1st/4th Battalion, King’s Own Royal Lancaster Regiment., at Uccle, Brussels, Belgium, Feb 1919. 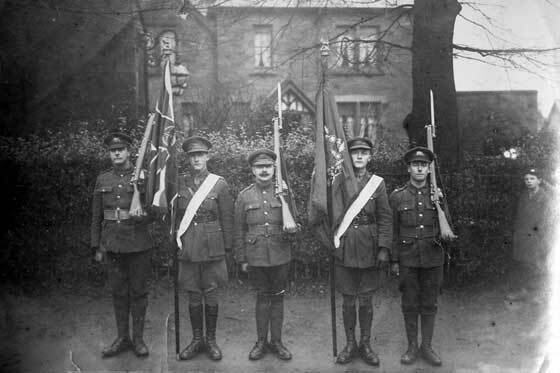 Rear row, left to right: Padre Sayers, Lieutenant Andrews MC; Lieutenant David Burr; Lieutenant S Steeple; Lieutenant Alexander Fyfe; Lieutenant Elliott. 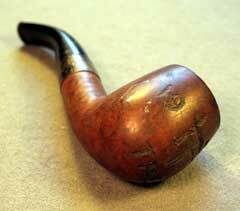 Middle row, left to right: Captain and Quartermaster P W Powell MC; Padre ? ; Lieutenant R W Higginson; Lieutenant Frazer; Lieutenant Scott; Lieutenant R S Dane MC and Lieutenant John Wykeham Lugard. 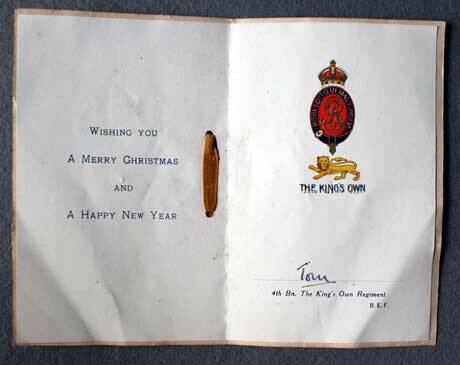 Card mount for the photograph ko2956/29 which records all the names of the officers. Separate for conservation reasons. Marked Photo Jules, 27 Place Communale, Molenbeek-Bruxelles. 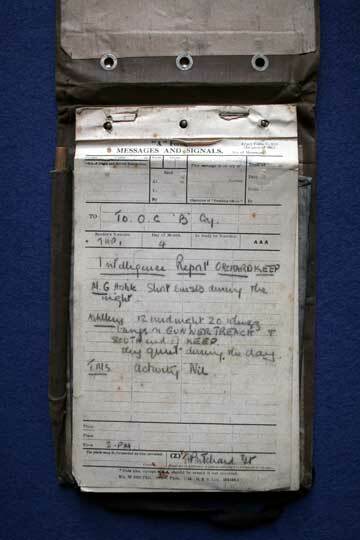 Booklet on the actions at Givenchy and Festubert, 9 Apr 1918 to 16 Apr 1918, named to 2nd Lieutenant T H Pritchard, ‘B’ Company, 1st/4th Battalion, King’s Own Royal Lancaster Regiment. 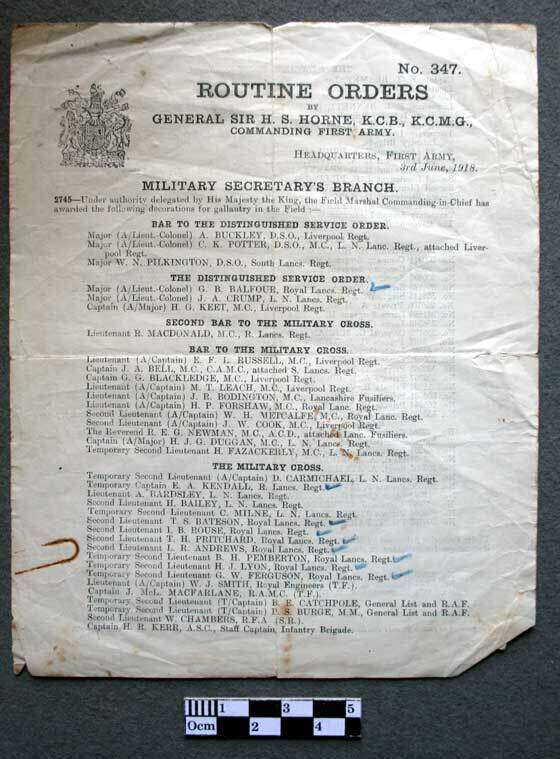 Routine Orders, by General Sir H S Horne, KCB, KCMG, Commanding First Army, 3 Jun 1918, listing the awards for the action at Givenchy in Apr 1918. 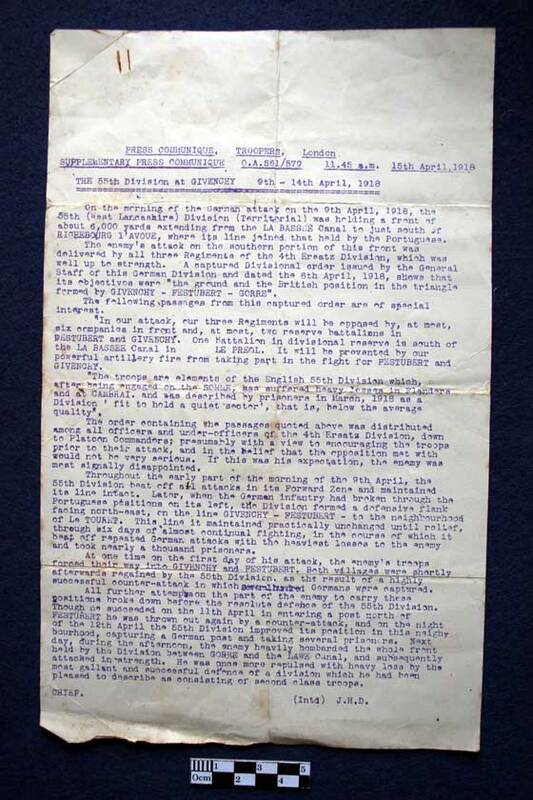 Press Communique, 15 Apr 1918 – The 55th Division at Givenchy, 9 Apr 1918 to 14 Apr 1918. 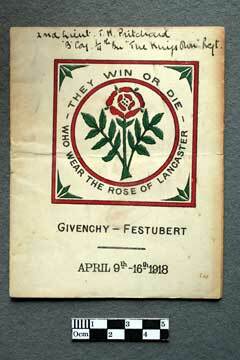 Battle of Givenchy-Festurbert 9 Apr 1918 – 35 Years Ago. 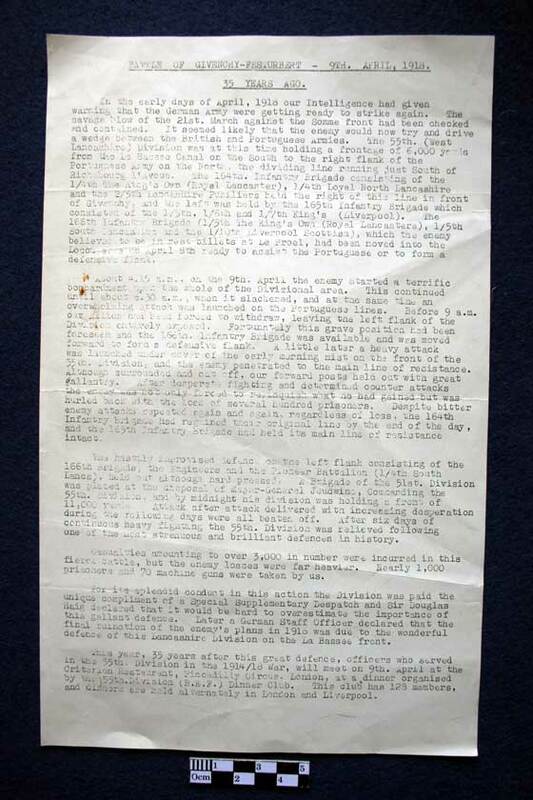 Typed report of the actions. 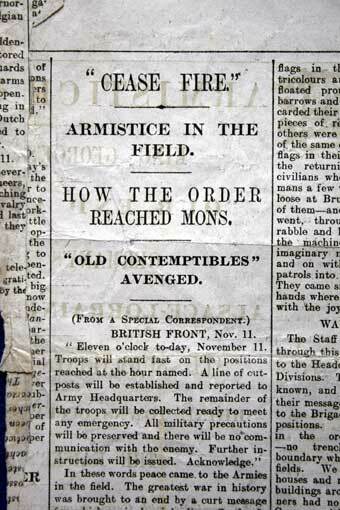 Newspaper cutting from 12 Nov 1918 with report of the 1st/4th King’s Own in Leuze. 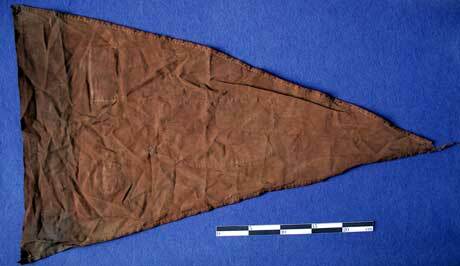 The band of the Barrow men played “God Save The King.” None heard it without a quiver of emotion. 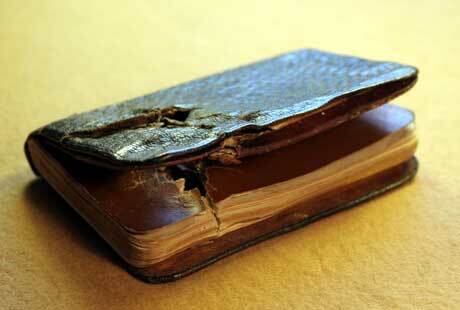 The mud stained troops paused in the crowded street, the hum of the traffic was stilled. A rippling cheer was drowned in the first notes of the Belgian hymn; the “Marseillaise” succeeded it, and the army of each Ally was thus saluted in turn. I do not think anyone heard the few choked words of the old Mayor when he tried to voice the thanks of Belgium for this day of happiness. Hazebrouck 5A. 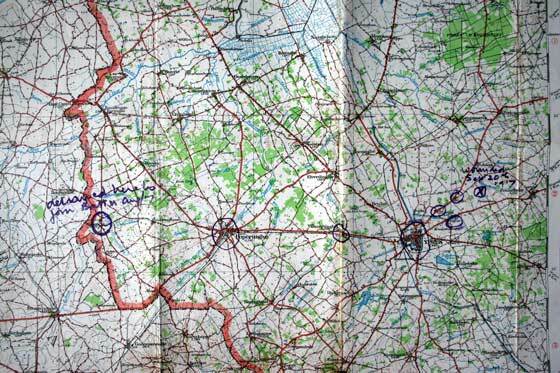 1:100000 Ordnance Survey, 1916, Edition Two. Newspaper cutting from 27 Sep 1924, The Daily Courier. 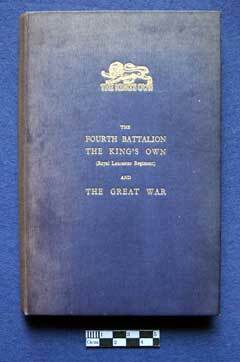 Featuring articles on the 55th West Lancashire Division. 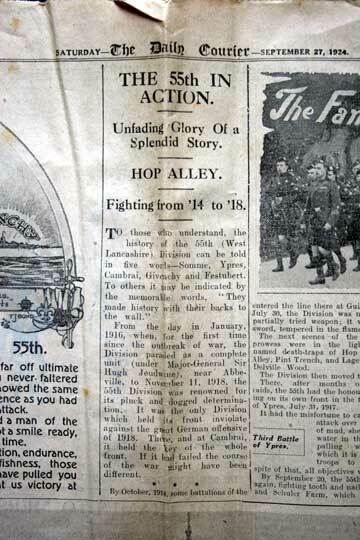 Newspaper cutting from 19 Jan 1925, The Liverpool Daily Post and Mercury. 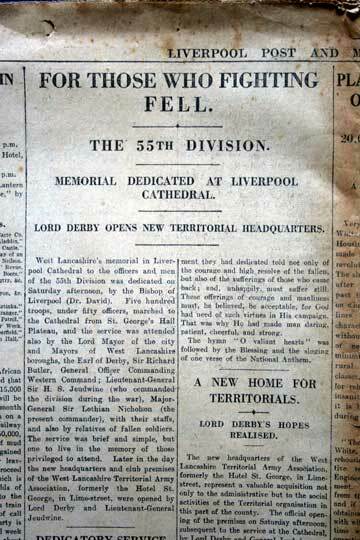 “For those who fighting fell – the 55th Division Memorial Dedicate at Liverpool Cathedral. 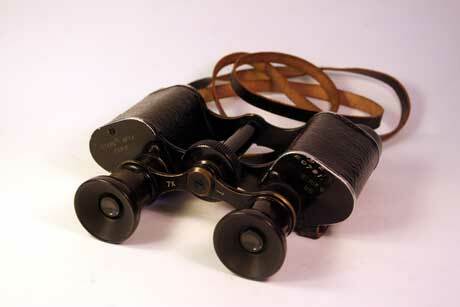 Field Glasses, First World War, named to Lieutenant T H Pritchard of the 1st/4th Battalion, King's Own Royal Lancaster Regiment. 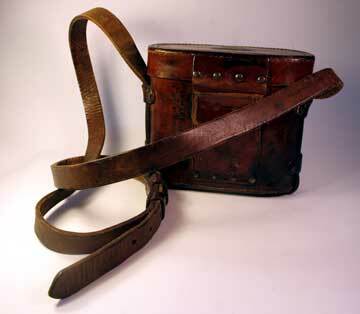 Field Glasses leather case, First World War, named to Lieutenant T H Pritchard of the 1st/4th Battalion, King's Own Royal Lancaster Regiment.